In testimony before U.S. Congress on March 16, 2017, Jay Akridge, Glenn W. Sample Dean of Agriculture, stressed the critical role that researchers and educators will continue to play in feeding a growing global population. Akridge said the need to remain competitive globally comes in the midst of complex challenges and concerns, including the availability of water, increasingly variable weather, and consumers’ heightened interest in how food is produced. 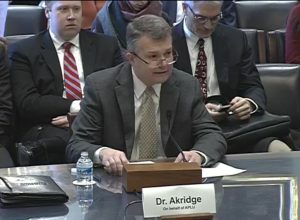 Akridge, speaking on behalf of the Association of Public & Land-Grant Universities (APLU) as the chair of the Policy Board of Directors, made his remarks before the U.S. House of Representatives Agriculture Committee’s Subcommittee on Biotechnology, Horticulture and Research. He said public funds are needed to support agricultural research and extension, which have made a significant impact for more than a century. Corn yield, which grew from 30 bushels an acre in 1930 to 175 bushels an acre in 2016, is one small example of how research and technology can have a significant impact, Akridge said.